People who deal with large sums of money should be called “financiers” whether they like it or not. Reputation managers, public relations agents, and spinmeisters working their magic on a clueless press and a forgetful populace have re-defined words so frequently that they have lost their meaning. “Financial engineers” used to be the “rocket scientists on Wall Street” who concocted esoteric “derivatives” but when these products went south they became “innovators” working on “alternative investments” – which were presumably alternatives to the stuff they came up with previously. Eventually the International Association of Financial Engineers changed its name to the International Association of Quantitative Finance with the goal of “advancing the field of quantitative finance.” Presumably, their members who once called themselves “financial engineers” are now “quantitative financiers.” After their next blow-up I wonder what term they will advance the art by calling themselves something else. I think everyone who deals with large sums of money be called “financiers” first and foremost. The reason is that it has the broadest possible definition. The use of the term peaked in the 1920’s anybody doing anything with someone else’s money could call himself (or herself) a “financier.” Following the crash in 1929 people discovered that the term was meaningless and many would have been more accurately described as “crooks.” There was a slight peak during the merger boom in the 1960’s, but the its popularity has been on the decline until very recently. 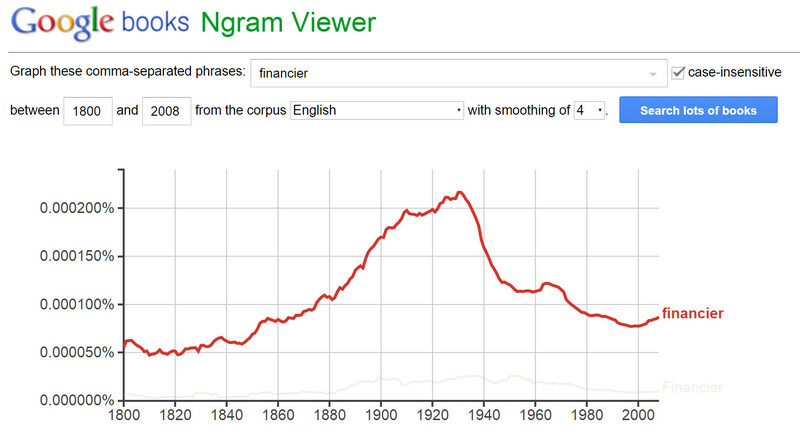 I am very happy the word “financier” is been making a comeback. The reason is that the word still has a negative connotation, and hopefully that means people will be skeptical when they come across someone calling themselves a financier. It is too much work to distinguish between financial engineers and ethical financial engineers, quantitative financiers and ethical quantitative financiers, commercial bankers and ethical commercial bankers, mortgage bankers and ethical mortgage bankers, hedge fund managers and ethical hedge fund managers. Instead, let’s call them all financiers and then determine who wants to be an ethical financier and who doesn’t. And among those who say they want to be ethical financiers, let’s determine whether they are or aren’t.